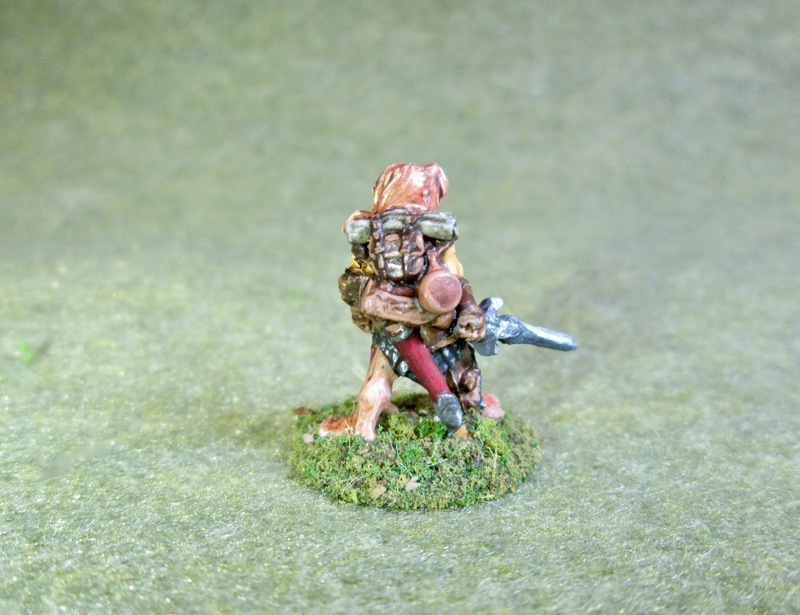 Dingo, Halfling Rogue: Bones 3 Figure | H.A.W.K.S. 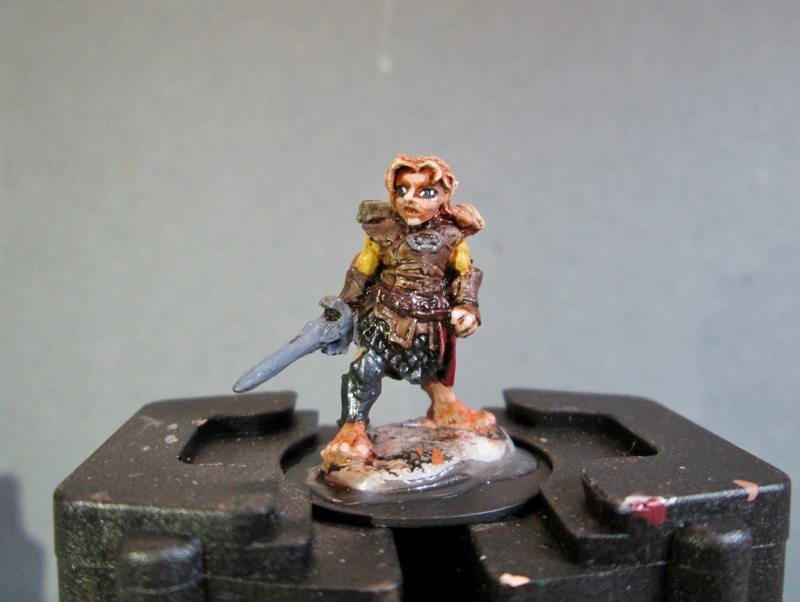 I continued to work on my Halfling Crew this week, and Painted Dingo, Halfling Rogue, from the Bones 3 Core set. 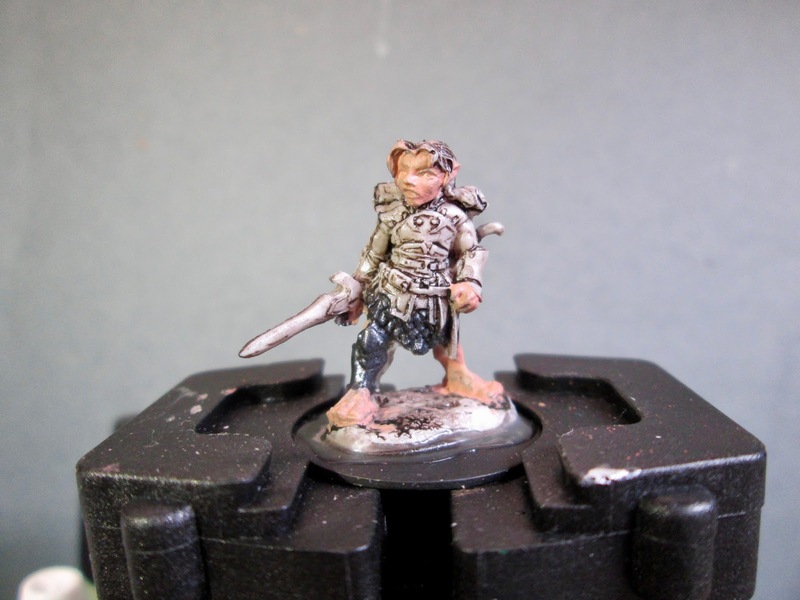 I was a bit surprised as I studied this figure to see that it is the same base figure as Woody Stumpwimple, Halfling Ranger, that I painted last week; with the both the torso and legs being exactly the same. I wonder how often Reaper does this kind of reuse with figure bodies? Next, I painted the shirt with Accent “Golden Harvest”, and then the torso armor, and wrist guards with Americana “Asphaltum”. I then painted the sash with Ceramcoat “Black Cherry”, and his/her hair with Americana “Terra Cotta”. Next, I worked on all the stuff the figure is carrying. I realized at this point the figure was carrying a bow and quiver (A rogue? ), so I carefully cut off the fletchings on the quiver, and tried to make it look like some sort of long thin case. I also lopped the end off the bow, and figured I treat the lower half of the bow case as his/her scabbard. I then painted the backpack with Accent “Real Umber”, and the blanket roll with Folk Art Dapple Grey". After that, I painted the ex-quiver with Reaper MSP “Turkey Brown”, and the canteen with Crafter’s Edition “Spice Brown”. Where I cut away the fletchings and there was little lumpy spot left, I just covered it with some Americana “Mississippi Mud”. I then painted the “scabbard” with the Black Cherry", and then painted the sword and the metal bits on the scabbard with Americana “Zinc”. Then, after everything had a while to dry, I gave his body a wash with Citadel “Agrax Earthshade” wash, and the face hands, and legs a wash with Citadel “Reikland Fleshshade” wash. When the washes were dry, I painted his eyes, and then highlighted the face with Reaper MSP “Tanned Highlight”, then did some further detial highlights by adding a little White to the “Tanned Highlight”. 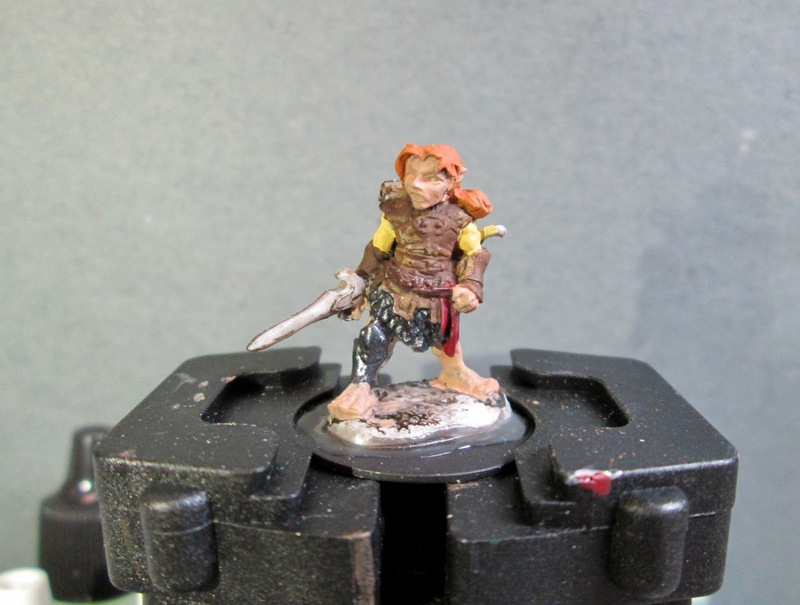 Next, I highlighted his/her hair with some Accent “Golden Oxide”, and then mixed a little Ceramcoat “Maple Syrup Tan” to do lighter highlights. Next, I highlighted his shirt with Crafter’s Acrylic “Bright Yellow”, and his sash with Folk Art “Burgundy”. I then highlighted his leather armor with the Accent “Golden Oxide”, and his belts and backpack with the “Mississippi Mud”. After that, I highlighted his blanket roll with Folk Art “Gray Green”, and his ex-quiver and canteen with Americana “Sable Brown”. I then painted the sword, scabbard fittings, and the small oval plate on his/her chest with the “Gunmetal Grey”, and when dry, highlighted it with Ceramcoat “Metallic Silver”. 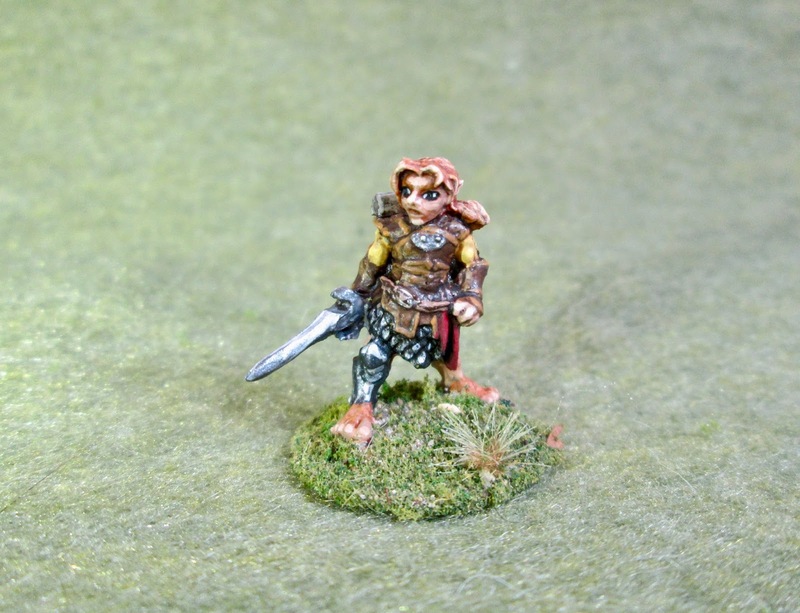 I’m happy with how this Halfling turned out. I think he’ll make a good edition to my Halfsized-Heroes Crew. Very nice. That Halfling is quite the pack rat! “Tacky glue” is that a permanent glue, like Super Glue? 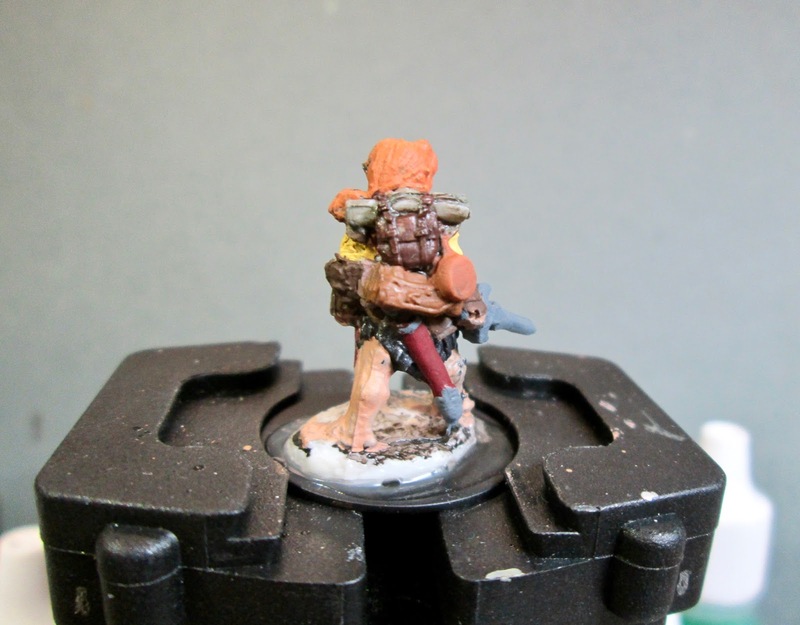 I’m always looking for an option other than Blue Tac to temporarily hold a mini to a painting base. I nearly bought the Citadel Painting Handle in my last online order, but the store was out. Thank you, doubledowndice! Tacky Glue is a white glue (Like Elmers) that is flexible when it dries, as opposed to the hard brittle way Elmer’s dries. It’s thicker and stickier (hence the name), and is aviable in most major craft stores, sold as Aleene’s Tacky. When I attach figures to a painting base (I usually use tongue depressors to put my figures on) I like to use a drop of regular old Elmers white glue. 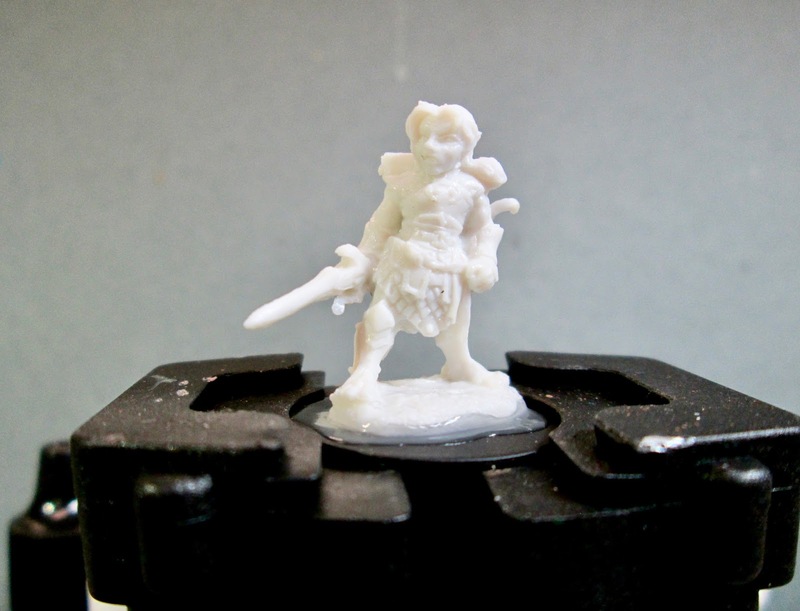 Since it dries brittle and doesn’t adhere to non-porous surfaces (like metal or plastic), it’s easy to slide a hobby knife under the figure, twist it, and the figure pops free. Ah, that sounds like an awesome way to mount minis while painting! I’ll have to give that a try. Nice job Chris on the halfling! Lately I have been using poster tacky to secure my Minis to specimen jars. It comes off very easily and can be reused. Of course I am still painting stuff from 30 years or more ago. I probably need to get a vise or clamping system for some stuff (game aids) I am making for Combat Patrol (retro sci-fi). Might have to wait until I recover! Take care. Thanks, Mark! Yes, I’ve heard poster tacky works well too. In the end there’s no right or wrong way; it’s just whatever each person finds works best for them. I’m really liking this clamp I got, though. However, I don’t think it will be good for doing units of similar figures assembly line style…you’d need too many of them. I hope you’re feeling all back to better soon! Thanks for the good wishes! Agree totally on the right and wrong, and for me everything is evolving anyways. Take care!